It’s that time of year! Time to dust off the decorations, whip up your favorite holiday recipes and visit with family and friends. It’s a busy time of year, with annual festivals, parades and decorations making an appearance once more. With so many festivities taking place throughout Palm Beach County, it can be hard to know where to start. To make things a little easier, here are the top five seasonal events that we’re most excited about, all just a short drive from Arden. Is there anything more romantic than walking hand-in-hand under twinkle lights and lightly falling snow? Plan a date night to CityPlace in West Palm Beach to witness the nightly snowfall during the holiday season. Get in some shopping, have a quiet dinner and then enjoy a rare quiet moment strolling with your honey. 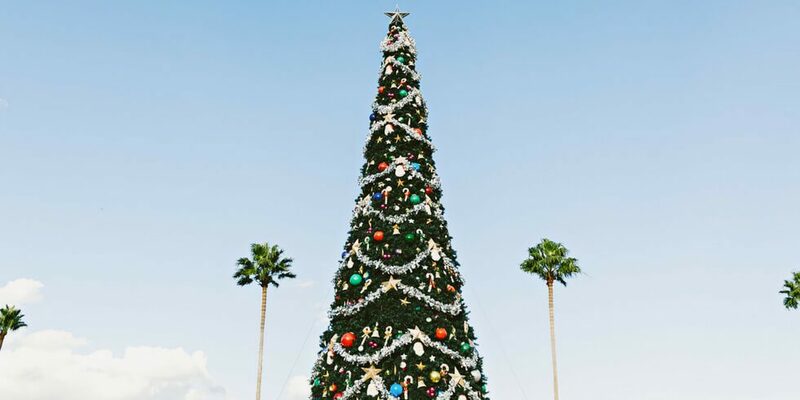 Imagine the look on your kids’ faces when they see Delray’s 100 Foot Christmas Tree for the first time! Soaring above the surrounding buildings and glowing with lights, it’s quite a sight to behold. Not to mention the full calendar of events in the area! From cruises with Santa to movies shown on huge outdoor screens to live carolers, there’s something to put everyone in the holiday spirit. Hoffman’s Winter Wonderland is a tradition for many Palm Beach County families. With more than 125,000 lights, it’s the perfect way to get your Christmas light fix. Plus, with a magnificent 12-foot Christmas tree, photo opportunities with Santa and Mrs. Claus, live entertainment and food from San Francisco Puffs & Stuffs Inc. Concessionaire, there’s something for the whole family to enjoy. Go WILD this New Year’s Eve at the Palm Beach Zoo! Spend the afternoon with the whole family learning about your favorite animals, having your face painted, showing off your moves at the dance party and celebrating the New Year with an apple juice toast. Even better, the event is included in regular zoo admission so you don’t need an additional ticket. After a day at the zoo, ring in the New Year at the adults-only celebration going on at the Wyndham Grand. Dress up in your finest and enjoy the hors d’oeuvres, gourmet cheeses, a live DJ and an open bar before counting down to midnight and enjoying fireworks. It’s a highly popular event, so get your tickets early to save your spot! Visit Arden to experience the wonder of this area, surrounded by nature, but just minutes from tons of shopping and recreation options. Interested in learning more? Join our Founders Club to receive news and updates.